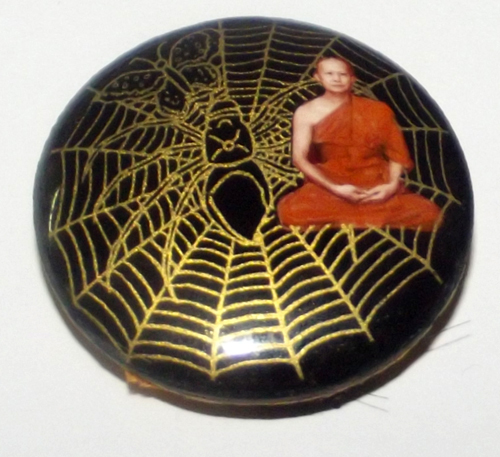 Maeng Mum Maha Lap Dak Sap, the ‘Money Trap Magic Spider Lockets’ from the Wai Kroo ceremony of 2554 BE (2011) at Wat Tham Faed. 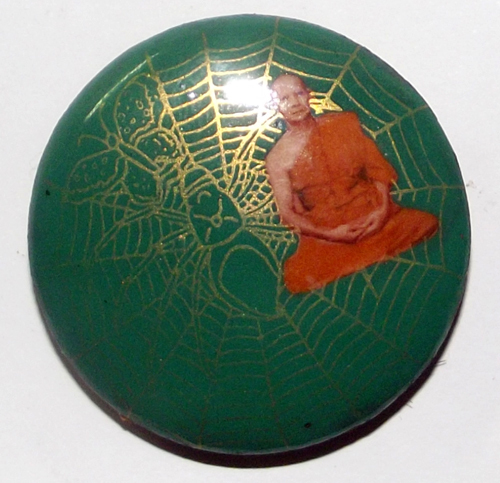 The lockets feature a small image of Luang Por Vachira, with the Maeng Mum Dak Sap sitting on its web, waiting to catch its intended prey (in this case, money and treasures). 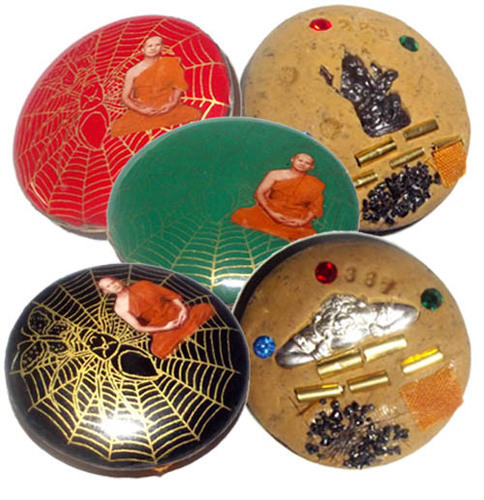 Each locket is filled with sacred muan sarn of hundreds of different holy and magically powerful ingredients, as can be expected from a nationally famous top temple with top guru master presiding. 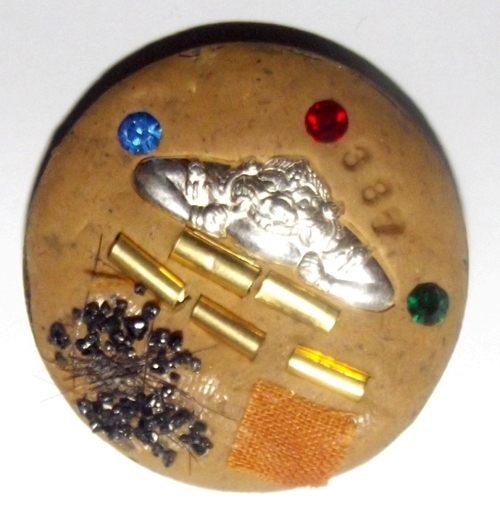 The lockets have three gemstones inserted (‘ploi sek’). Ploi sek are blessed enchanted gems with maha pokasap blessings to attract great treasures and collateral. Five takrut spells are inserted, a piece of civara robe from Luang Por Vachira’s robe, and a loi ongk deity statuette, which was made with two different versions, one with a Ganesha deity to remove obstacles and induce prosperity and success, and the other version with a Pra Rahu deity, also to remove obstacles, bad luck, and induce prosperity and success. The lockets were made in small (‘pim lek’), and in this large size (‘pim yai’). Each size was issued in three different colors, namely: red, black or green. The spider is a special creature, for the fact that it never goes hungry or is unable to find food and sustenance, and therefore the perfect survivor, who lives as well in hard times as in easy times. The spider never misses his meal, laying his traps to catch his prey, and coming back later to find the net is full of his choice meals. 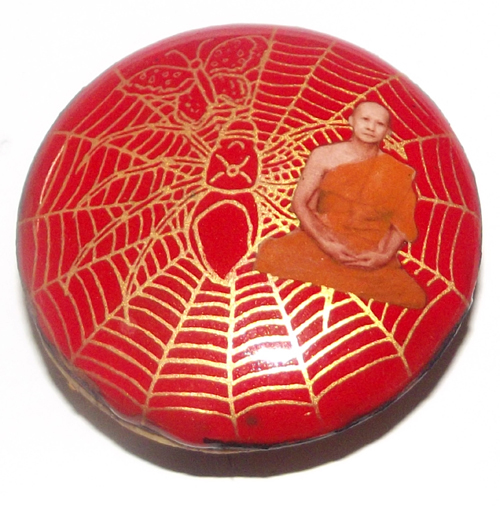 The spider lockets are empowered to attract, reel in, and keep money and treasures that float by as opportunities, and draws wealth and treasured items into your possession. 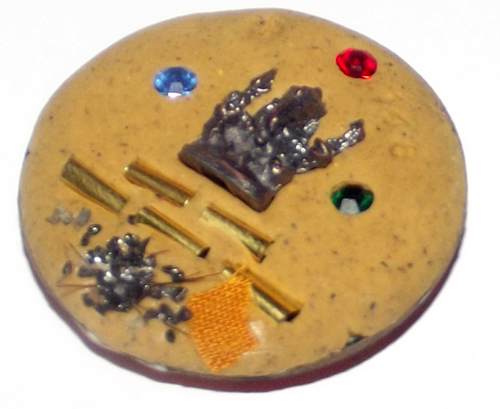 The image of Luang Por Vachira presides over the amulet, and reminds of his blessings. When praying to the amulet, one should think of Luang Por Vachira and his lineage masters and all the kroo ba ajarns of the past of this lineage, and call upon their protection and blessings. Chant the Maha Namasakara thre times (‘Namo Tassa’) three times first. Aehi Aehi Aakajchaaya Aakajchaahi Aehi Jidtang Bpiyang Ma Ma Riak Choke Riak Laap Khao Suu Khaapa Jao Duay Tern. Aehi Aehi Aakajchaaya Aakajchaahi Aehi Jidtang Bpiyang Ma Ma ; then think as hard as possible, and say in your heart with the most focus you can muster:”Call luck and wealth to come to me please“”.